The New Epromer-5 is finally here!!! The EPROMER is the natural upgrade from the Epromer-2 and Epromer-4 (more than 2050 units sold in less than 12 months). This new unit is able to program even the old 2732 chips that requires 21 and 25V of programming voltage. With the new WINDOWS software, Epromer5N, you have more flexibility than the previous Epromer2 and Epromer-4 DOS version. The Epromer windows software was designed to bypass the lack of access to I/O ports in WinXP, WinNT and Win2000 platforms. We have report from one Beta customer needing to use the USERPORT utility to gain access to their Win2000 I/O ports. This Windows version can be used with the previous EPROMER-4, EPROMER-5 or the new EPROMER-6 electronic board. 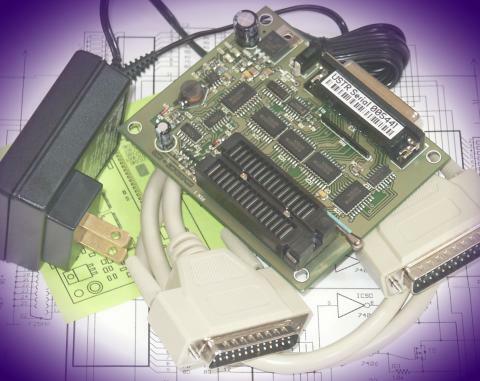 The software is able to recognize and adapt itself for any of those different boards. The Epromer board is made in double layer FE4 fiber-glass circuit board, with surface mount technology to improve reliability and small size. Every unit is double tested before shipping, with burn-in tests of 24 hours right after production. 27C080 from different manufacturers as ST, TMS, AMD, Intel, Atmel. We do not recommend OTP chip to be used for domestic programming. OTP units are basicaly for large production in controlled environment. 24C08 - 24C16 - 24C32 - 24C256 - and Parallel Eeproms as; 28C256 (XICOR) - and Flash Units as Catalyst units, A29040 (AMIC) - AT29040 (Atmel) AM29F040 (AMD) - 29C256 - and uC AT90S2313, and others. 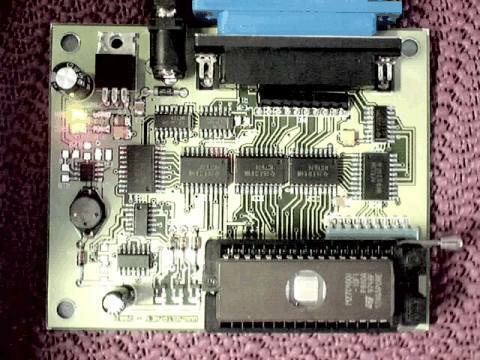 At the left is the actual picture of the Epromer5 board, with the ZIF socket installed. Eprom Chip is not included. It allows you to read and save device memory contents into computer binary files to use in the future. It allows you to Clone Master Devices, or program devices from existent binary files. It gives you ability to deal with 16 bits system, with Both, Hi or Low Byte. The hardware board can be plugged at the LPT1, LPT2 or LPT3 DB25 connector. must use a 9V@300mA or 9V@500mA adapter. 4. DB 25 Molded Round Cable, (not flat). Shipping to USA is made via USPS Priority Mail with Delivery Confirmation Receipt, the next day of confirming the deposit of customer payment. Pending payments at Paypal will be waiting for conrimation before shipping. Money orders and Personal Checks will be deposit at our bank account and wait confirmation before shipping. This product is 30 days money back guarantee, upon a charge of $25 restocking fee if the product returns in perfect condtions. We do not refund shipping expenses that is $10 flat. Return or refund shipping is by customer expenses. All support for this product operation is to be done via Email to steve@ustr.net.